Looking at the contemporary exterior of this mansion, you’d never think the inside would be furnished with old world antiques. But when you walk inside, it is as if you were transported back in time to 17th and 18th century Europe. Rienzi is the European Decorative Arts branch of the Museum of Fine Arts Houston. Like Bayou Bend, it is a residence transformed into a museum. 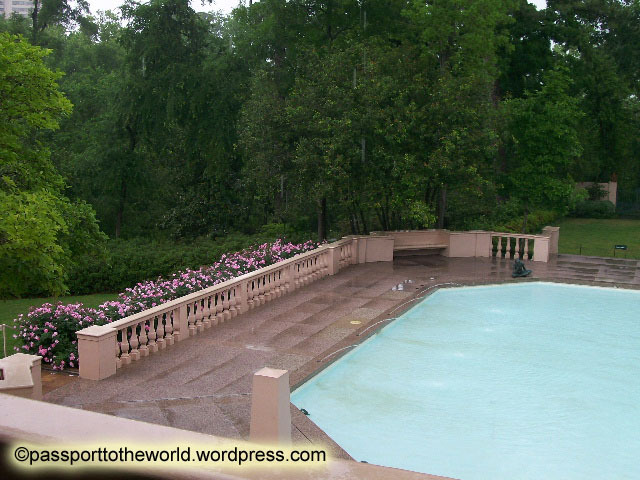 Rienzi is also located in the Homewoods subdivision of the River Oaks section of Houston. It belonged to philanthropists Harris and Carroll Masterson and they donated their house and art collection to the MFAH. They commissioned architect John F. Staub, the same architect who built Bayou Bend, to build this mansion to house their art collection. The main part of the house was built in 1952. They had another architect add an addition with a ballroom in 1971, but it is so flawlessly done you cannot tell that it was built 20 years later. There is a lot of customization throughout. There are tons of glass-encased shelves to show off the figurines and fine china that Mrs. Masterson collected. There is a room that was designed for 4 pillars representing the 4 seasons from 1600’s Italy. One of the closet doors is a fancy carved door from 1600’s Moorish Spain. We found the docents to be very knowledgeable about the art and furniture in the house. They told many great stories about the pieces- where they came from and what they were used for, and gave us many insights on how people lived in 17th and 18th century Europe. Attention to detail is very evident in both the mansion and the art collection. The crown molding and pillars are embellished with floral designs and gold paint. There are oriental rugs throughout. The furniture is very ornate and detailed. Very fancy. I could spend all day admiring this stuff. It’s the kind of furniture you’re afraid to touch and rugs you don’t want to step on, let along sit down and make yourself comfortable. I wonder if the furniture was arranged this way when the Mastersons were living here. Maybe they only put some of the fancy stuff out when they were entertaining guests? I’m sure the MFAH probably moved some furniture around and added some pieces. But imagine having kids running around here, and grandkids. Or family gatherings. I love the artwork and furniture here and think the art in this museum is truly amazing, but I don’t think kids in general would have quite that same appreciation. 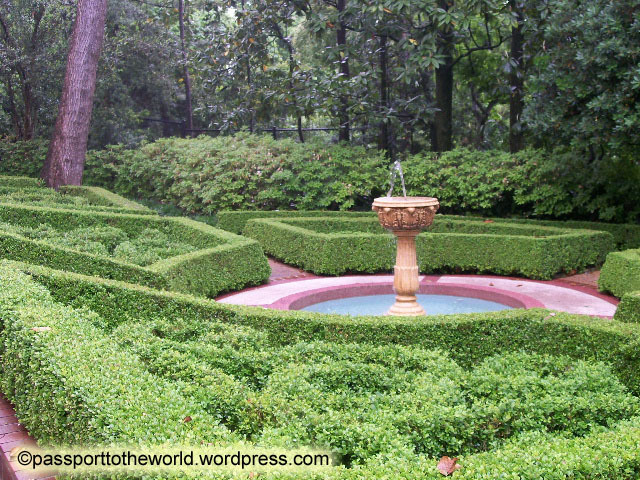 Rienzi is situated on about 4.4 acres, so the gardens are smaller than that of Bayou Bend. But just the same, they are neatly landscaped and very nice. Of course it was drizzling out the day I visited so I wasn’t able to walk around the gardens that much. And the flowers were not in season, so there was not much to see except for the irises. 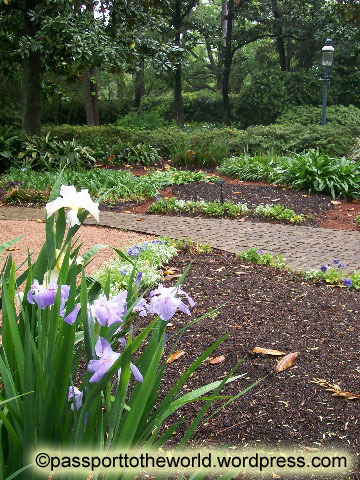 Though this is also a stop on the Azalea Trail in March, so I’d imagine it will be very pretty when the azaleas are in full bloom in March. 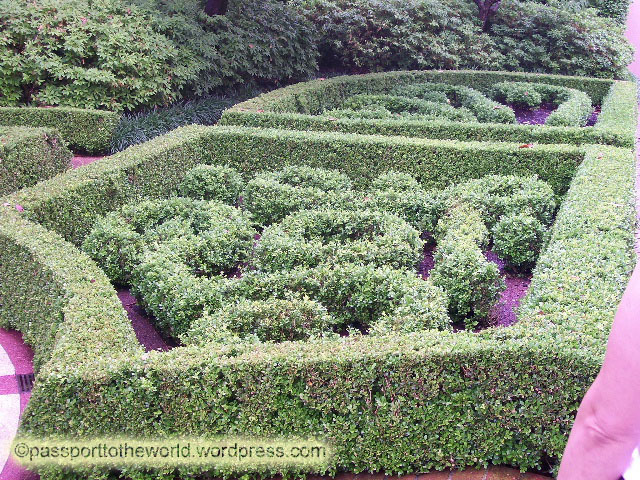 This entry was posted in USA and tagged art, 相片, 美國, 藝術, gardens, Houston, museum, photography, Texas, travel, USA, 博物館, 德州, 旅遊, 休士頓. Bookmark the permalink.